Back row: Malinda Ellen "Linnie" Hooten Boone, Hubert "Gordon" Boone, Roy Clarence Boone, Charles Aaron "Charley" Lyon, Franklin Greenbury Lyon, Orron Treat McLallen, William Franklin "Will" Wood, James "Pascal" Boone. Third row: Leah Jane Boone McLallen holding Orron "Hurshel" McLallen, Etta Emma Boone Wood, Maud May Minnick Boone. 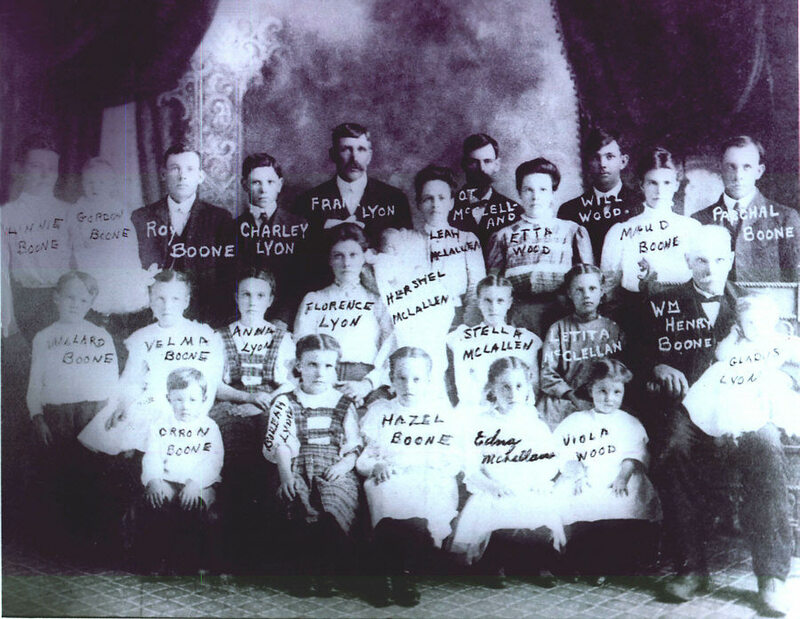 Second row: Herbert "Willard" Boone, Mary "Velma" Boone, Anna Mae Lyon, Florence Leah Lyon, Estella A. McLallen, Letitia M. McLallen, William Henry Boone holding Gladys Lucille Lyon. Front row: Orron Levi Boone, Beulah Lyon, Hazel Gladys Boone, Nancy "Edna" McLallen, Viola Wood. Thanks to Debra Barnhill for sharing this photo!